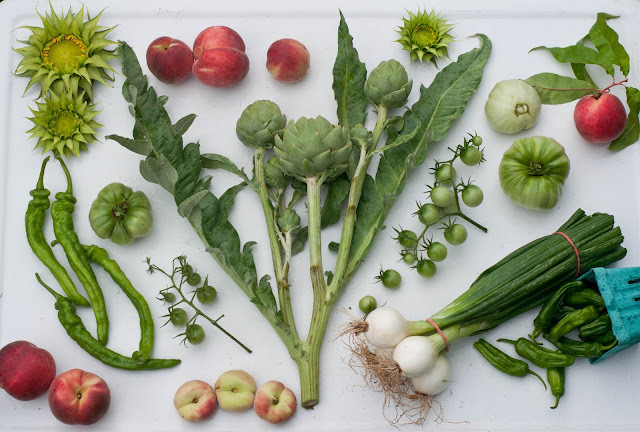 Robson's Farm: 2019 Market CSA Enrollment Open and a Note on Getting Creative! I had the chance right before Christmas to go to a goal setting workshop hosted by one of my farmers market customers. Through out her goal workshop we were asked to pull out our theme for 2019 from what we had written down. For me creatively is the word that kept coming up. So 2019 you are the year of Creativity (and if you were curious also the year of the pig). Last year was a violent weather year. The farm flooded 3 times to the point where the irrigation (lay flat as it's called) was floating on the water. Crops were completely submerged in water. We lost a large portion of our tomato crop and almost all of our peppers. So when you have a more limited offering how do you keep your beloved customers excited for the next season? This is a question I rolled around prior to opening up enrollment for 2019. I've been compiling a list of creative things to bring you fresh inspiration, interest and excitement around being part of our Market CSA. More recipes. I have put together quite a few recipes over the years but there's a need for more. Especially on those harder to tackle items like escarole for example. I love escarole and I know you will too if you give it a try. Partnering with other vendors we love to have a few more things for you to pick up at the farmstand. Creating an interesting new flower concept. And trying to be more diverse in our offering by trying our very best to have beans this year (sadly deer love green beans as much as I do), more melon options, and a goal of having summer squash/zucchini available each week in August and September. Showing you more of the farm via video clips on the blog and instagram stories. And a few other treats you'll be getting delivered to your inboxes. Interested in getting in on the fresh and fun food?